All parents want their kids to be healthy and happy. Physical activity especially when combined with sound nutrition, is an important component of a healthy lifestyle and is vital for optimal health and development. Physical fitness offers many benefits for children (and the rest of us), including a heightened sense of well-being, increased confidence, and a positive body image. Parents do a great service to their children when they strive to incorporate physical activity into their lives. Children take their lead from the example that is set for them by parents and other influential adults. While they may learn some of life's lessons from the things that their parents tell them, they discover far more from watching how their parents live their daily lives. Parenting requires more than merely "talking the talk." Good parenting means "walking the walk," as well.Parents who prioritize physical fitness are likely to raise children who do the same. We humans are creatures of habit, so encouraging children to develop healthy habits right from the start is a good idea. As most adults know, retraining ourselves to make healthy eating and exercise choices can be quite difficult; once established, bad habits can be hard to break. Parents should be sure to approach physical fitness with enthusiasm, rather than behaving as though exercise is a distasteful chore. One of the most important steps that parents can take to boost their family's activity level is to limit the time spent on sedentary activities such as watching television, playing video games, and using the computer. While most kids enjoy these pastimes, there are far healthier ways for them to spend the bulk of their time. Families can take walks, ride bikes, or roller-blade in their spare time, helping to build both healthy bodies as well as strengthening family bonds by sharing activities. Young children typically have an abundance of energy and it is wise for parents to encourage their children's natural tendency toward active play. All too often, we require kids to sit still and keep quiet and then wonder why the childhood obesity problem seems to grow every year. Children's natural desire for activity should be cultivated rather than squelched; parents should not only allow their children to run, swim, and climb trees -- they should get out there and participate, too! Most kids would prefer game playing to calisthenics and most adults probably feel the same way. Exercise doesn't have to be boring. In fact, the best types of activities are those that bring enough pleasure to make children want to repeat them, preferably for a lifetime. Sometimes, adults get so caught up in the idea of exercise as a means toward an ideal body image rather than a way to be healthy and have fun. Parents who make time to play and be a little silly with their kids will encourage them to enjoy themselves as they develop healthy habits. Life sports (those which people enjoy throughout their life span) are best learned in childhood, and parents are the best teachers and examples for their kids. Swimming, tennis, and golf are great examples of life sports. In addition to sports and game playing, fit people often look for ways to boost their activity level during their regular daily comings and goings. 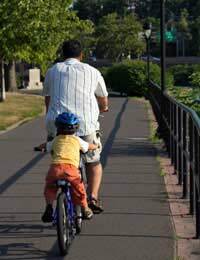 Families should walk or ride bikes on errands when feasible, and when it is necessary to take the car, parents should park toward the back of the lot to increase the distance that they and their children are walking. Choosing the stairs over elevators or escalators is a good idea, as is encouraging young children to walk on outings, rather than pushing them in strollers. Even household chores can contribute toward maintaining healthy activity levels. Cleaning and yard work can help keep kids fit, as well as teaching them to be helpful and responsible people. When parents stay actively involved with their children, both generations benefit, making it good for the whole family. Does Sport Have to Be Expensive? Re: Can Too Much Exercise Damage a Child?